ROME - The Malicious Use of Artificial Intelligence (MUAI) is the greatest terrorist threat our world will face in the coming years, the international community has been warned by Darya Bazarkina, a professor and researcher at Russia’s Department of International Security and Foreign Policy. 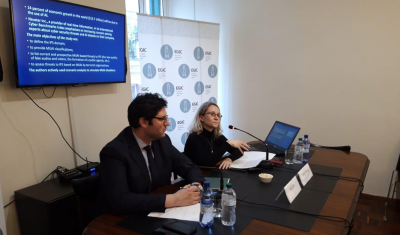 Bazarkina, who addressed the Euro-Gulf Information Centre in Rome in April, spoke at length of the threat advanced technologies will pose as the cyber-sphere and artificial intelligence (AI) become ever more sophisticated. AI has in recent years proven a great asset to human development. The public sector has thus far been able to harness its capabilities in industries such as health, finance and transportation. In fact, it is predicted that AI will soon make up 14% of global economic growth, and a staggering 26% of China’s national economic growth, such is the speed at which the capabilities of AI and machine learning are growing at. However, Bazarkina, who has recently released an important paper investigating the threats posed by advanced technologies, suggested that rather than simply laud the positive aspects of AI, significantly more should be done to address the risks it brings. AI, she posits, can be harnessed as readily as a weapon as it can a tool for human growth, and its dangers are psychological as much as they are physical. MUAI has already been used as a tool of terrorist propaganda to great effect, and Bazarinka was quick to reference so-called “Deepfakes,” falsified videos of prominent figures endorsing hate speech or terrorist activity and organisations. In the private sector too, the dangers of advanced technologies are tangible. A recent poll published by Neustar, an American technology company, brought to light that 82% of security experts were concerned about the use of MUAI against their companies. MUAI’s danger lies in the unpredictability of its use, and the difficulty posed by countering and tracking down threats. Psychologically too, it can be hard to detect its use but its effects can be devastating. Terrorist organisations have been able to harness AI to target profiles online for recruitment. Latent MUAI should also, Bazarinka believes, be of particular concern to governmental and private organisations given its nature as even more profoundly undetermined. As the threat of terrorism continues and the climate of fear in society increases, Bazarinka called on governments and the international community to focus more acutely on countering the threat of MUAI worldwide. Measures to fight MUAI must be introduced and societies better educated on the threats posed by technologies and the cyber-sphere so that individuals can also protect themselves. Darya Bazarinka’s full prognosis on the threat posed by advanced technologies and artificial intelligence can be read in the Russia in Global Affairs Journal.